In general, I would discourage thumb sucking or pacifiers after the age of 4 because they may lead to overcrowded and crooked teeth, as well as bite problems. In some cases, the upper front teeth may tip toward the lip or not come in properly if thumb, finger, or pacifier sucking continues after the age of 4. 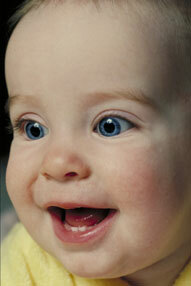 From six months to age 3, your child may have sore gums when her teeth erupt. Many parents use a clean teething ring, a cool spoon, or a cold wet washcloth. You also can rub the baby's gums with a clean finger. A mouth appliance may be effective on children if they are still sucking their thumbs or fingers when the permanent teeth arrive.